as well. It was one of those right place at the right time scenarios. 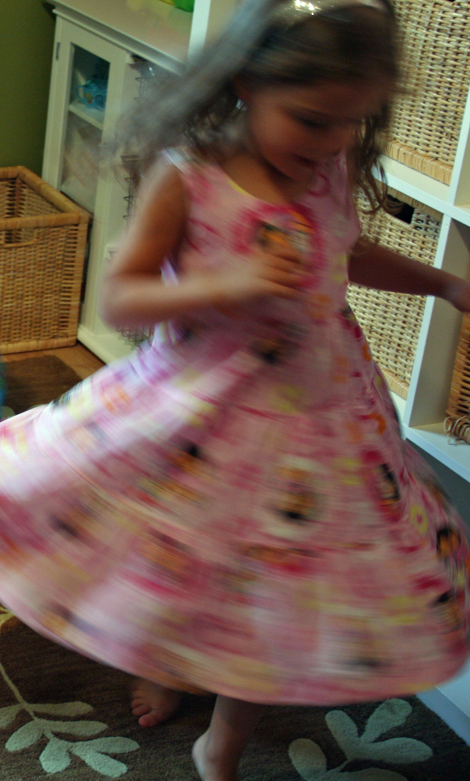 "mumma, I need a twirly dress too!" dress from July. Hmm, things were starting to become very clear at that moment, Miss A was going to have her dress. pinned and stitched. 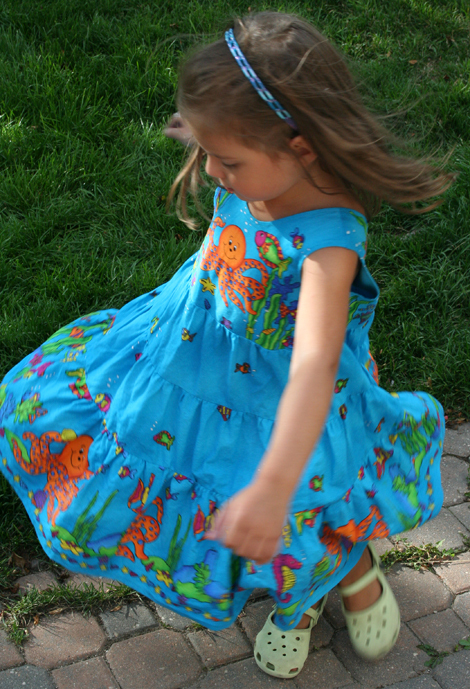 Better all around for the twirl factor. did do it for love. That dress turned out perfect! I wish my girl would wear a dress. Just once, or twice, a year. Oh man, I'm feeling for ya. I was a tomboy and never wore dresses either...unless forced, now I love skirts. 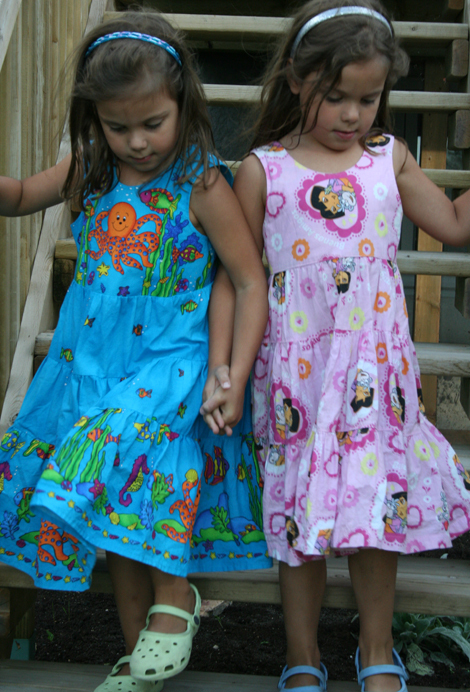 My girls are tomboyish and the first few summers I always had them in cute pants/shorts and they always wanted dresses...so now I give them dresses. It's almost like reverse psychology. The blue one. We also have a very similar second one with a beach theme. 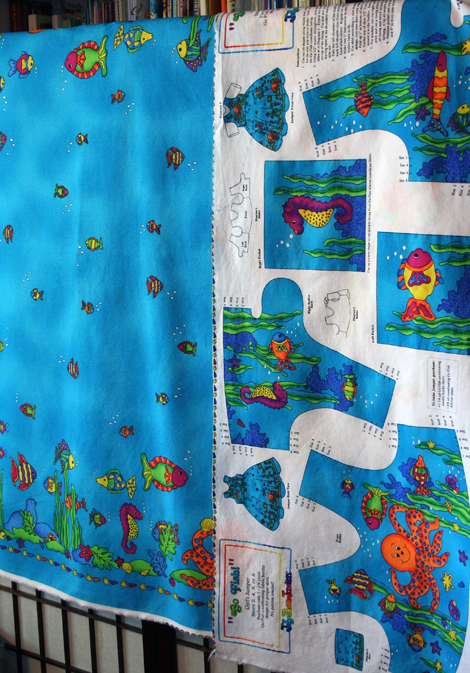 Fun beach dresses! so funny! I found the panel of fabric at a thrift store for $2 and had to take it home and make it. very good on for twirling. I just found you through the Pinning Grand Central of the planet. 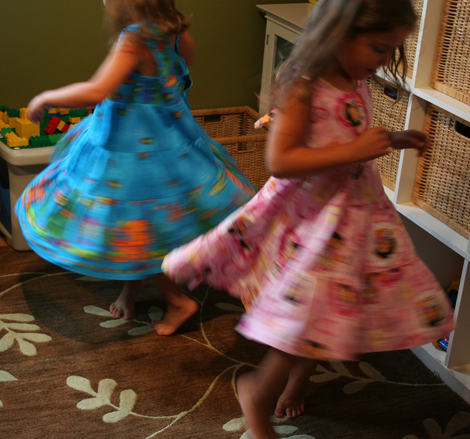 Looking through your stuff was great fun, and now I want a twirly dress, too. I just have to figure out how to make one my own little self. I so admire people who not only can do things, but can also write about it. Thank you also for the lounge pants tutorial. ONe thing about the interwebs is this mass of learning and sharing we do. It's generous of you to share what you've figured out. My compliments on your coolness, my dear. Welcome here and thanks for your very kind words :) I always want a twirly dress when I see how free and easy my girlies make wearing them <3 I hope you make good use of the lounge pants and enjoy, enjoy, enjoy!